June 2014 : One round circle – a mandala composed of more than 60 courageous souls – teachers and health workers identifying themselves as ‘survivors’ of the super typhoon Yolanda (international code name Haiyan) – – one of the strongest tropical cyclones ever recorded in history and had its first landfall in the middle of the Philippines. And while in the circle, each one had their right hand on their heart center while the left hand placed palm-to-palm with their partners; both tuning in to the flow of breath and extending joy and healing to one self and the other; and extending the same within the circle, then to the whole island, and on to the greater expanse of the planet. The outer circle circumnavigated around – being-by-being, feeling-to-feeling, communing in the vibration of love and healing, while I allow the guidance of Grace to channel through layers of meditative communication. I was in awe to witness and experience the unfolding journey of us all in the circle. Humility, indeed, is the stepping stone to real servant-leadership – and to claim the essence of divine humanity. 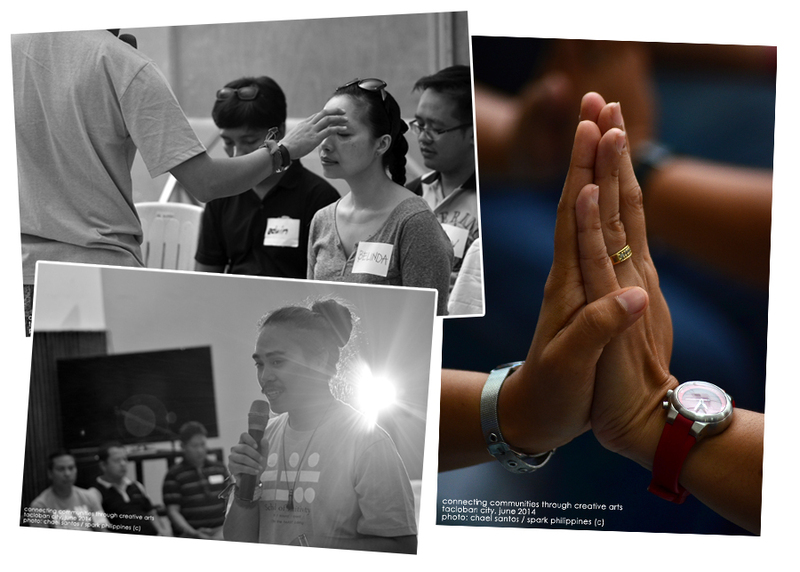 As the summer solstice unfolded in time passing, I was with the group called Spark Philippines – an NGO based in the country – with their team members and invited facilitators including myself. The intention of the team was to offer an experiential-learning, psycho-social therapy for the participants – mostly teachers – so they could convey the lessons from the workshop to their respective classes from primary school to college. 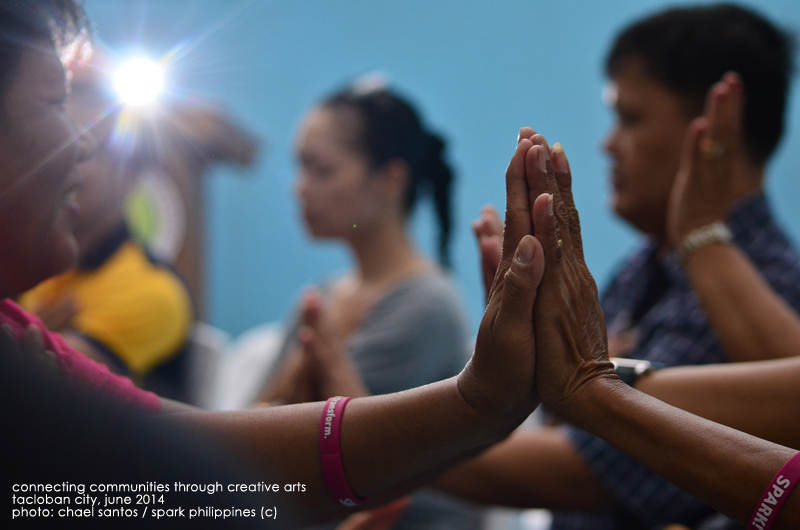 The theme of the workshop was called “Connecting Communities through Creative Arts”. I was assigned for a morning session. When I tuned in, I was guided to offer three components of body-mind-spirit practice: Breath. Sound. Movement. And so, we began with breathing meditation – each person becoming conscious of the flow of breath within the body-mind system; taking their time to be aware of the transition that allows a heightened sense of sensitivity with its subtle degree of shifts when one is not yet in full remembrance in awareness and alignment of the circuitry of soul-heart-mind-body. And yet, in simplifying the flow and rhythm of the interactive session, I joined in the circle as guide yet breathing along with the whole group – while soothing musical sound graced the experience of breathing anew, consciously and allowing the essence of gratitude to land deeply within. In the first session, we learned how dolphins breathe and we imitated their way of breathing to appreciate these gentle creatures of the sea; also we learned the ‘fire breath’ — we thought of ourselves as volcanoes and we had much fun; and then the essential nature of ‘love’s breath’ – a reminder of child-like breathing, where we allow the breath to go deeply, ballooning our diaphragm with pure air of spirit and releasing-extending it with sense of grace and freedom. I was astounded with the open and honest responses of each individual – profound insights and heartfelt statements bringing tears and joy at the same time to many in the room. The session was a powerful reminder to cherish the goodness of life in contrast with their intense encounter with the storm – some with near-death experience. 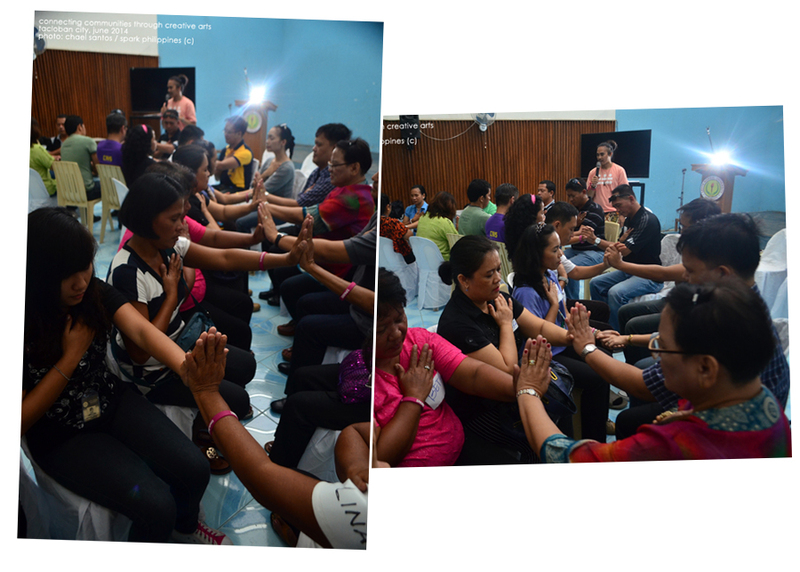 After the session, they have shared to include the breathing exercises in their respective works – in their classrooms and even in local council meetings. In particular, an elementary school teacher came to me and shared that she will have it as an activity for her class. She felt that it will help her young students to come in contact with conscious breathing and to ease out the nervous feelings. I gladly received what she shared with a smile and gratitude in the heart. The breathing practice was also a helpful guide to activate one being’s clarity and alignment to mind-body responses in times of chaos – according to studies, “remembering to breathe in emergency-disaster situations is helpful to calm the system and clear the mind”. After a short insightful interaction with their experiences with conscious breathing, we all slowly transitioned to sound exercise – giving tonal frequency vibration to breath by feeling through the sound tunnels of the body, the feeling-beat of the heart and the amplification of released air via the mechanics of the diaphragm and the nervous system. The whole group was divided into four small pockets of “tribes”; and were then separated to find their own comfortable spot in the room. The first invitation was to tune in with the cycle of the breath and then allow any sound to vibrate. And each group composed their own rhythm. The sound of humming reverberated in our spatial bubble. We played with the word “gugma”, which means “love”, by chanting the phonetic tones of the syllables. “Guggggg—– mmmmaaaaaa” and repeated several times. It felt really GOOD to feel the vibration of the word. And then the next bit was for each group to come up with a word or words that resonate with their collective energetic harmonies. I gave them few minutes to explore and commune in the oneness as a group. What followed was something we couldn’t have orchestrated as a group. I pointed my hand to a group and they chanted the word “Love” — “Laaaaaahhhhhhh—–hhhvvvvvvvvvvvvvv”. They continued on as I pointed to another group to begin – and what came out was “Laaaaaahhhhhhh—–hhhvvvvvvvvvvvvvv”. All our eyes were wide open for feeling surprised. Both groups continued to chant as I pointed to the next one. “Jjjjjjjjjjjjhhhhhhhhhhhoooooooo —– oooooooooyyyyyyyyyyyy”. And by now, there was a fusion of different sound frequencies. In a short moment later, I pointed to the last group and what came was “Jjjjjjjjjjjjhhhhhhhhhhhoooooooo —– oooooooooyyyyyyyyyyyy”. All the same balancing frequencies. And after several rounds of chant by the last group, all of us just intermixed with laughter, and joy, and were plainly surprised with the whole experience. We all giggled and laughed all the more. All smiles beamed in the bubble. There was even a sense of disbelief of how it unfolded for us all. The smiles and laughter and sharing continued. The simple exercise has shown us an analogy of how heartfelt communication could connect people. That we are all Wi-fi connected. That we are beyond mere bodies… we are divinely human. We connect in the stratosphere of the Divine. It was also a demonstration that different communities could respond to other communities either for help or for healing or to celebrate the joy of living together. I was in awe of the experience. I offered my gratitude to the Guide that was orchestrating the flow of the session. What happened next was intensely dynamic and fun. It was to incorporate the practice of conscious breathing, sound element, and this time with bodily movement. So with the same groupings, I assigned each team one of the four elements: Fire. Water. Air. Earth. They were then given time to utilize their creative imagination and intuition to internalize and express the quality of the element using the body as the ‘communion and communication device’. So, I began by pointing to the Water people. It was a theatrical moment (with some lighting effects on), it began slowly like the sound of a small brook. Then it was intermixed with other voices mimicking watery sounds and it intensified into waves in crashing motion. All were seated in round circle and their bodies were moving sideways; their feet were stomping and making loud sounds. While they continued on, I pointed out to the group assigned for Air. Again, such creative intro of a whistling sound – their arms were swaying above their heads. And the wind sound got stronger – and now a chorus of water and air sounds. It was followed by the Fire tribe. We heard a siren call and then some firework sound blasts and an echo of volcanic eruption. The orchestra of elements played on. When I invited the Earthlings to join in, the whole room was filled with dynamic energies. The earth people played on animal sounds including a monkey sound which one lady was really game on playing out. She was fantastic in performing it as well – you know that sense of freedom to be a little child once again, so free and full of innocence and joy. I then asked everyone to stand on their feet and move around – to interplay in the circle – it seemed chaotic yet things fell in order. They were milling around the circle in playful manner. And a little later, I instructed them to return to their circle and then an invitation for silence. The sound evaporated slowly, naturally. And then all of us contemplated for a moment, breathing consciously, feeling each other’s energetic frequency and allowing things to be. The whole room was enveloped with blue light (from the stage lights) which added a touch of solemnity somehow. And when all the room lights were turned on, everyone were looking at each other with smile on their faces. And then we continued with our sharing. One female in the group expressed her felt-experience by saying that when we were milling around the circle, she was reminded of the time when her family had to walk around town with all the rubbles and chaos and with other people walking in all directions as if they were like ‘zombies’ – not knowing where to go and feeling helpless. She allowed her feeling sense of the memory to make her reconnect to the experience; she said that even for a short while, it was disturbing to have such memory, yet knowing to be in a safe environment, she tuned in with breath and returned in the embrace of the group energy. I watched the sun rose the following morning as it painted the town with its golden light, my heart-felt gratitude expanded from within and extended all throughout. A few hours later, we visited a community village to interact with the children. It was joyful to see the flow of grace running the show – the workshop participants were present to help facilitate the activities – which included dancing, singing, drumming, and gift-giving. We also offered the children’s shirts gifted by the Friends of the Heart to kids. 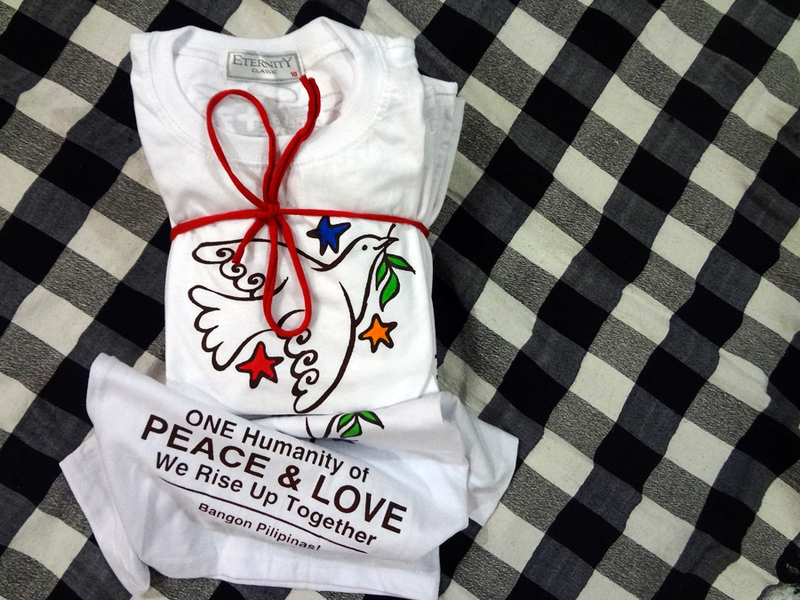 We desire that the message of the shirt will help spread the power of Love and Peace. Through the help of Friends of the Heart circle, Elle and I managed to print 200 shirts. I made the design and processed the silkscreen and we both worked in the printing process of the shirt and hand-painted the colours on the design. We loved the whole process of it and that we are thankful of the support coming from supportive friends. Along with it are prayers of goodwill. I stayed another day after the event and visited some sites. I brought along some pieces of shirts with me. While on the road, I saw a community of men and women clearing an area and setting up a vegetable garden. So, I decided to visit them. I talked with and found out that they are indeed setting up a community garden for food supply – thriving in the midst of disaster. A moment later, some kids began appearing and so I grab shirts from my bag and offered it to them. In just about two minutes, all the shirts were out of the bag. It was great! I believe in love — and the happiness it multiplies. 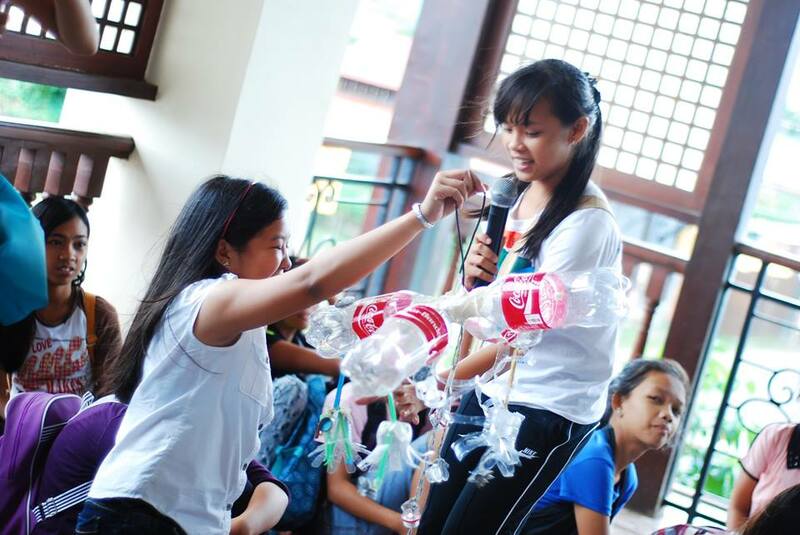 July 2014: In about a month later, we returned to Tacloban City to do another workshop with more than 400 highschool students. I offered an art therapy titled “From Junk to Funk” – an art process of assemblage of found objects from the rubbles after the storm. On the day before I did the workshop, I was told by a team member that the students were so noisy and cannot be silenced. So, I got curious about it and found it as a challenge somehow. When I arrived at the session hall, it was indeed an astounding sight of an army of students. We began with an energizer given which was fun. And then, it was my turn to do the workshop. 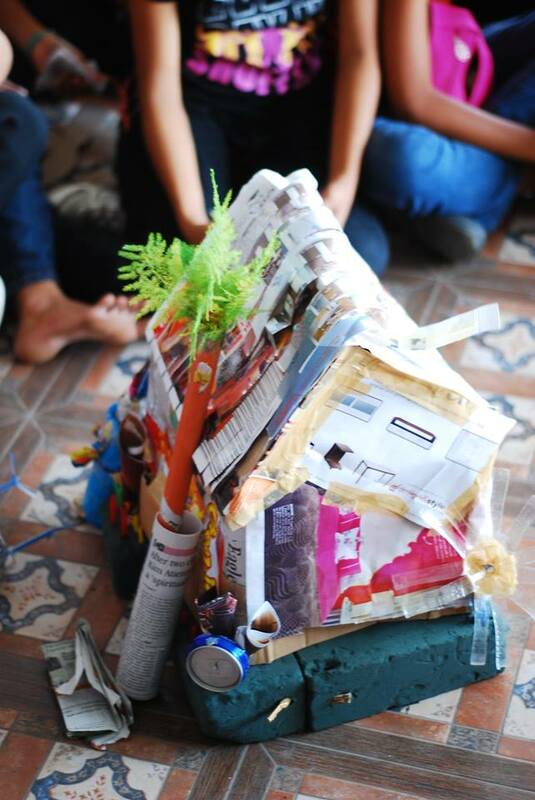 I introduced the activity with a short lecture about art history and the development of found object as art. The kids were amazed to see the sample works that I’ve shown them. And then, I asked them to go out for about 15 minutes to search for objects to use for their project. When they’ve returned, there seemed to be excitement about creating; everyone was talking and laughing it also sounded like that market. So, I called for everyone’s attention to settle down a bit and requested them to look at the wood carving on the ceiling – a mandala. I continued on talking about it and then I invited everyone to stay in contact with their breath. It took a little while to fully engage everyone’s attention yet when I shared about the practice of clearing the mind first before working on their art project and how helpful it is in the art process, they got the idea of it. I continued to guide them to tune in with their breath, feeling the flow of breath – in and out, in and out – I played some meditative music and then off we went to solitude. 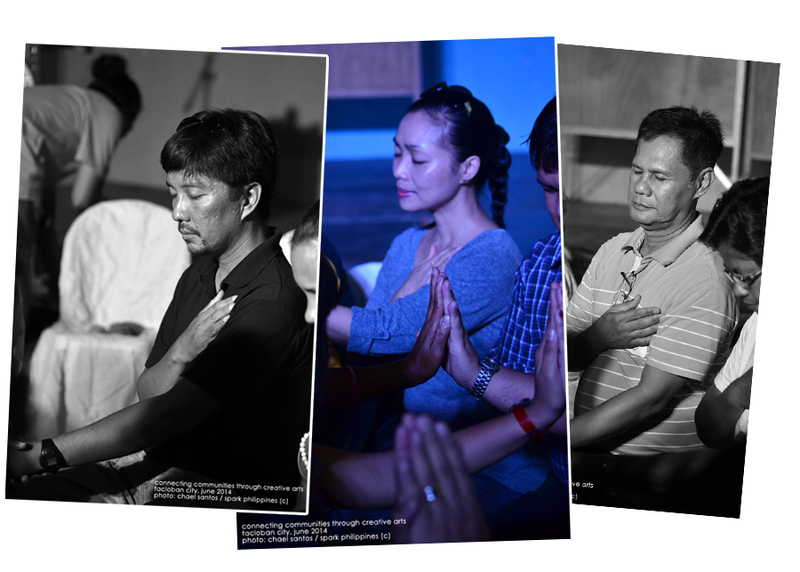 The Divine Grace was guiding me in the meditation process – as we entered a much heartfelt meditation, some of the students were already in tears… guiding them to feel the beat of their hearts and closing it with their hand touching the area of the heart. And then, we all moved on to the co-creation process. Each group made such great pieces and showed it to everyone and adding an interpretation of the symbology and story behind them. As Jeshua said, “Love, create, and extend”. My fellow facilitators enjoyed the meditation as well and were astounded to see a big crowd of young people in quiet meditation. I, too, was astounded with a big smile on my face and a heart in bliss.